The view from my hotel room in Sydney. You can see the peaks of the Opera House at the right edge of the bridge. The Community Restorative Centre (CRC)—an aptly named nonprofit in Sydney—works holistically with prisoners, reentrants, and their families from about four months prior to twelve months after a person’s release from incarceration. Providing intensive case management work for folks with a variety of needs, the organization particularly targets folks who have to navigate multiple significant risk factors, like homelessness, addiction, and mental illness. They work with family members to help facilitate transportation to visits and an understanding of the types of support that reentrants will need when they come home. Mindy Sortiri, one of the staff at the CRC, was kind enough to meet with me during my time in Sydney and explain to me a little more about what’s going on in Australian prisons. In general the Australians and New Zealanders I’ve met seem totally horrified by the lengths of prison sentences in the United States. The majority of incarcerated Australians—around 89 percent—will serve less than two years. Five percent of prisoners in Australia have a life sentence or another form of nondeterminate sentence. A life sentence here can mean natural life but seldom does. Many life sentences in Australia come with a mandatory non-parole period—a minimum number of years that a person must serve on that sentence which can range from ten to thirty-five years, though it appears that the upper limits of that range are infrequently used. Australia abolished the death penalty in 1973, and the folks who’ve mentioned the death penalty in the U.S. since I’ve been here tend to do so with a grimace and a shiver as if speaking of a form of torture from the middle ages, which in fact it is. Australians who get caught in the net of the criminal justice system do face many of the same issues encountered by their counterparts in other regions of the globe. A study produced by researchers at Griffith University in 2008 found that 42.8% of percent of folks in prisons in the state of Queensland have such low literacy skills that they could not read well enough to hold an entry level job or understand paperwork given to them by the prison system. Another study from 2014 found that most formerly incarcerated Australians will remain homeless and unemployed six months after their release from prison. Aboriginal Australians and the indigenous folks of the Torres Islands make up just 3% of the total population of the nation but comprise 28% of Australia’s prisoners. In youth detention centers 51% of those locked up are indigenous. Clearly, even with significantly shorter sentences than those we see in the U.S., Australian incarceration devastates communities and disproportionately affects people of color and those who lack education. Sounds a lot like home. The Community Restorative Center seeks to “improve our clients’ quality of life by providing practical and emotional support,” which strikes me as a noble and attainable goal. The most artistic wing of the CRC is a project called Jailbreak Radio. The program is supported by public health funders in New South Wales and broadcasts public service messages about HIV/AIDS and hepatitis C, but the bulk of the radio show features poetry, music, and interviews with incarcerated folks. It seems that there’s a lot of music programming in the prisons near Sydney. Local men’s and women’s facilities in Windsor have active musical groups, and the men’s prison actually has a recording studio inside it where Jailbreak Radio frequently records segments. Several reentrants work with the show’s host Kate Pinnock to help produce Jailbreak Radio, so the program itself offers both an artistic product shared with the public and real world training and support for formerly incarcerated people. Listen to Jailbreak Radio here online to see just how great the show is. The stage in the Cell Block Theatre today. I have a fascination with the ways in which old prisons get repurposed in new ways. I’ve heard about former prisons turning into boutique hotels, apartments, and psychiatric hospitals, all of which strikes me as depressing and unfortunate. Museums which inhabit former prison sites can eloquently honor the people who once lived and died inside them, as does Constitution Hill in Johannesburg, South Africa, but I have also seen some tasteless and unfortunate renderings of prison museums. There is a much more hopeful and innovative tradition of turning prisons into art spaces—of flying in the face of the original purpose of the building to unleash creativity. For the last ninety-three years, Sydney’s National Art School has done precisely this. As was the case for many prisons in the 18th and 19th centuries, the walls of the Darlinghurst Gaol in Sydney were built with convict labor. Construction began in 1822 and remained in various states of construction for the next fifty years. The first prisoners to live inside it arrived there in 1841, and the last ones left in 1914. 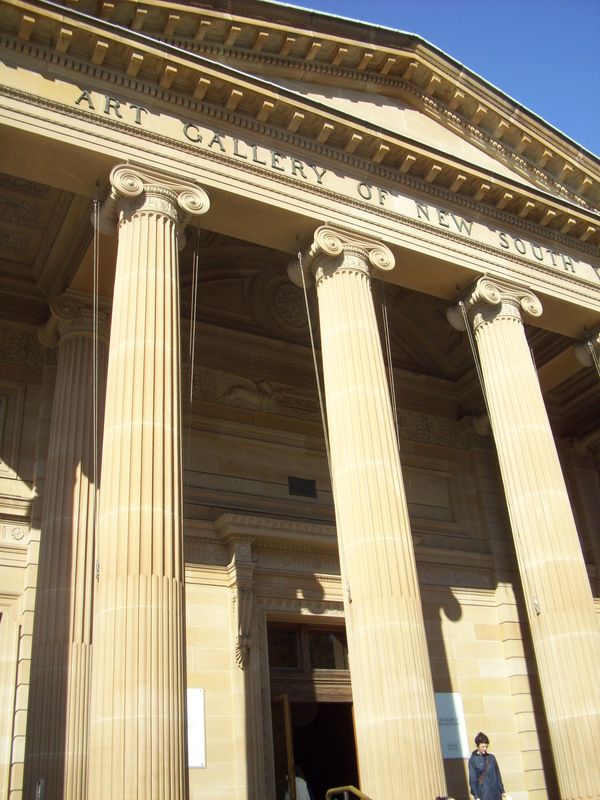 The origins of the National Art School can be traced back to Sydney Mechanics School of Art in Pitt Street, Sydney, in 1843. The Art School moved to occupy the former Darlinghurst Gaol in 1922, where it has remained ever since. Deborah Beck was a student at the National Art School in the 1970s. She studied painting and later went on to become a faculty member at her alma mater. During her time teaching at the school, she encountered boxes of photos and archival materials about the history of the Darlinghurst Gaol stashed in basements and odd offices, and she began to realize that no one else had documented or protected the historical record of her beloved school. Realizing that she had stumbled upon a significant archive, Beck became the official historian of both the prison and the school. Today she’s preserved over four thousand items—both artistic and historical—in the pristine archive and collections room, which she oversees in the top corner of one wing of the school. Beck worked with the state records office in Sydney to identify glass plate negatives which referred to the Darlinghurst Goal. The records of all the historic prisons in the city had been mixed together, and no one but Deborah knew which ones had to do with Darlinghurst. Her extensive research led to the publication of a book on the history of the Darlinghurst Gaol and the National Art School, entitled Hope in Hell (Allen & Unwin 2005). This official history of the various lives of this place up until 1975 has aided the school’s defenders in their repeated struggles to keep the historic prison as the site of the National Art School. Its prime location and picturesque setting make it a desirable property, and the government has made moves on multiple occasions to take the site back from the National Art School. As it stands today, the National Art School inhabits the former Darlinghurst Gaol in quite a charming way. The floors were removed from the tiers of the cellblocks, opening up high ceilings and beautiful stone walls with the remnants of the former floors still showing and the former windows and their iron bars intact but paned with modern glass. Painting, sculpture, printmaking, photography, ceramics, and drawing have their own buildings, and a lovely and spacious gallery occupies and entire building. 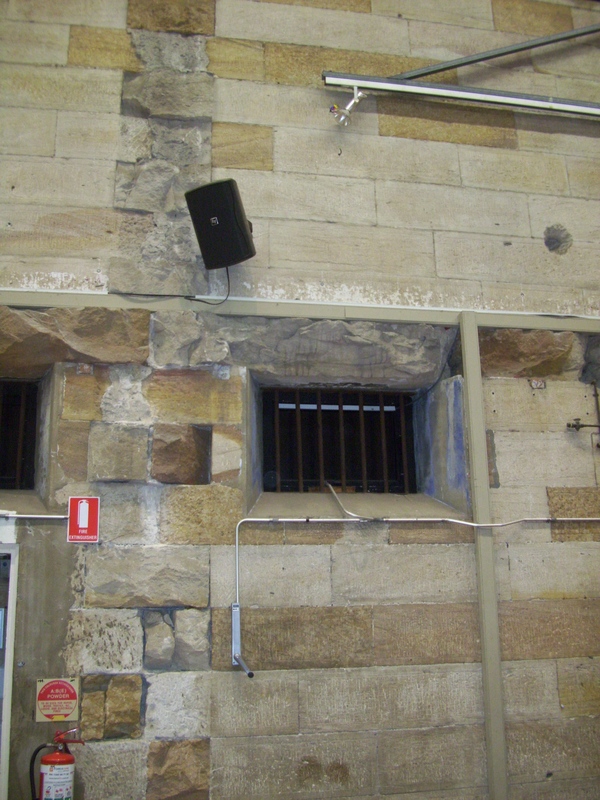 One of the original windows of the Darlinghurst Gaol, bearing traces of the original blue paint that covered the interior of the cells, now part of the Cell Block Theatre. The building that most interests me, naturally, is what is known as the Cell Block Theatre—a lofty and airy space with excellent acoustics—the former women’s section of the prison has served as a working performance space for decades. Katharine Hepburn announced that it would become a theatre in 1955, and since then its stage has been graced by a broad range of musicians, dancers, and actors. The roof has been replaced and a stage built into one end of the space, but the building’s life as a prison remains clearly visible. The original jail doors hover eerily on each of what would’ve been the cellblock tiers above the stage, and traces of the blue paint that used to cover all the prison’s walls remain around certain windows. The National Art School doesn’t train students in the performing arts, but the Cell Block Theatre, since its opening, has been a popular venue for music, theatre, and dance and private events. After attaining a master’s degree in history, Beck won a New South Wales history prize for her second book called Set in Stone (New South Publishing 2012)—this one a history of the Cell Block Theatre. The beautiful volume is replete with production photos and the posters and playbills for shows staged in the space. Unfortunately, both of Beck’s books are difficult to come by. I purchased my copies at the charming coffee shop on the campus of the National Art School, but I don’t know where else one might easily find them. 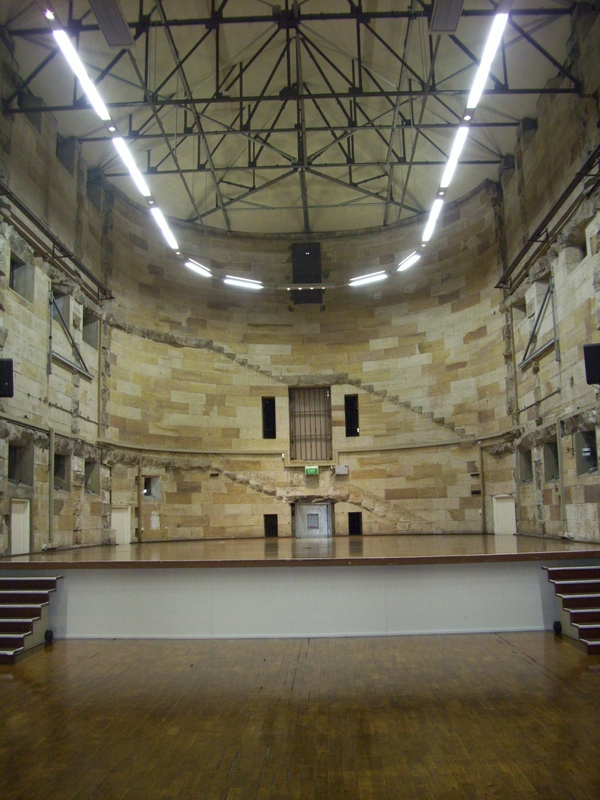 That said, the school itself and the Cell Block Theatre in particular are well worth a visit when one is in Sydney. They–and Deborah Beck herself–reminded me that incarceration doesn’t have to be the end of the story—that we humans are indeed capable of making beauty in a place where suffering once reigned. This blog post has benefited from the thoughtful editing of Deborah Beck. Thank you, Deborah, for this and for all of your work on the history of this fascinating place! When I wandered into the stunningly beautiful Art Gallery of New South Wales, I had just arrived in Sydney, was feeling a bit woozy from the time change, and hadn’t yet wrapped my mind around being awake o n the other side of the world while my loved ones gently slumbered at home somewhere in a nighttime I could not see. That said, I was still really excited to be in Sydney and wanted to see what I could see while keeping myself awake long enough to attempt to get onto a schedule more copasetic with this time zone. An art gallery seemed like a low key place to see some sights and learn a little about Australian culture. My first realization upon entering the place was that I could not name a single Australian visual artist. Thankfully, I was alone and didn’t need to admit this to anyone and have since remedied that profound area of ignorance. I now can remember the name of painter Rupert Bunny–an early twentieth century Australian who did some rather large and charming portraits and scenes of women from his era. The Art Gallery of New South Wales is home to a diverse set of collections, which the gallery has been kind enough to photograph and make available on their website so that you, too, can see some of the extraordinary art that I encountered. I’ll also include photos here that I took of some pieces which stood out to me, but if you seek these works of art out on the gallery’s website, you’ll find much better images. 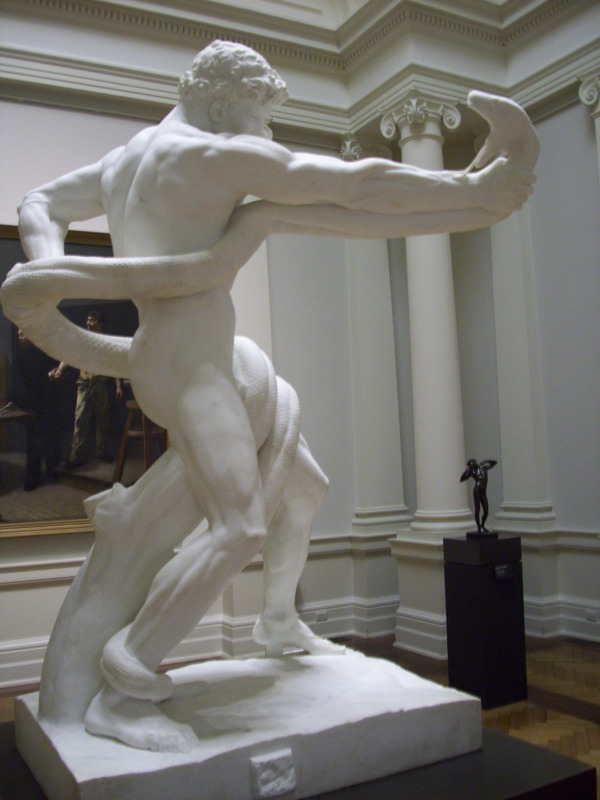 As a herpetologist’s daughter, I’ve seen a good number of pythons in my day, but this was the first representation I’d ever seen of someone wrestling one. Is than an Australian thing? I have no idea, but it made for a very striking and beautiful statue. 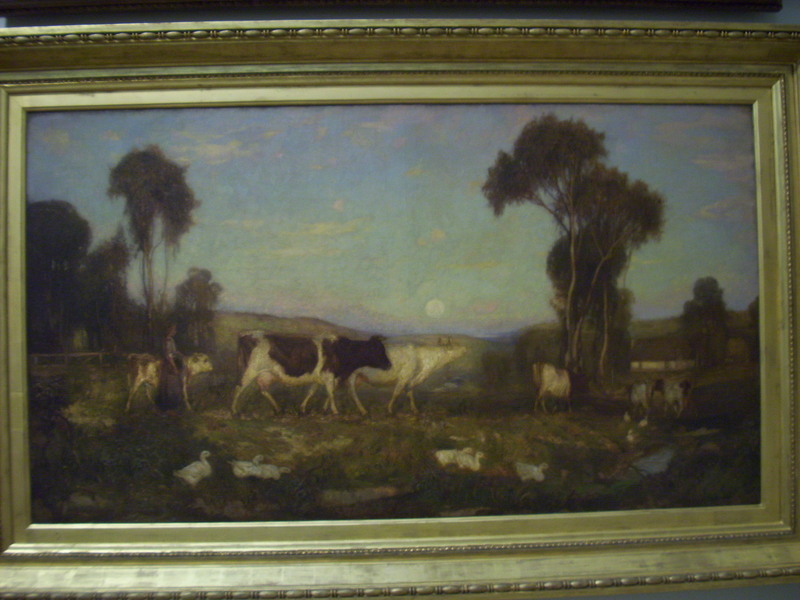 This piece, and many others by Australian painters in this collection, reminded me very much of a lot of the Texas art that hangs in parents’ home. Imagery of cattle and farm life recurred frequently, as did ranching landscapes which easily could’ve been Texas were it not for the appearance of kinds of trees that we don’t have in my home state. 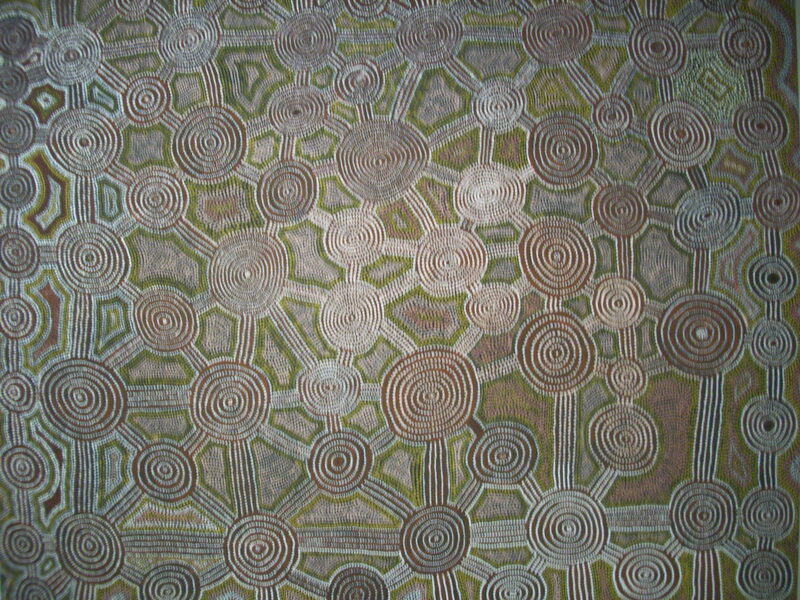 I’d never seen aboriginal art and was impressed with the way in which the graphic patterns in it made me as a viewer feel like I was falling into many of the paintings. This could be attributed to jet lag, I’m sure, but there’s a depth and texture to this style of work that’s ill captured in images of it. You really have to see it in person. 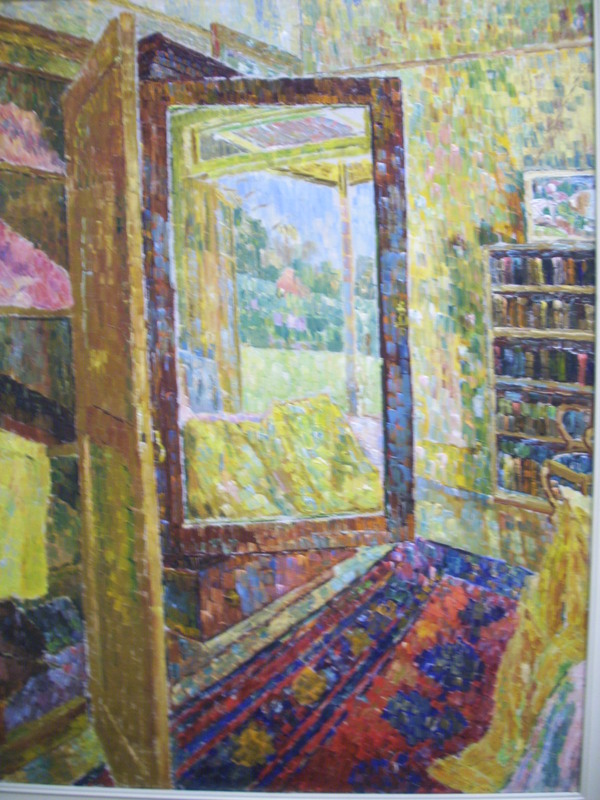 This piece of impressionistic Australian art by Grace Cossington Smith was really lovely to see. The colors are even more vibrant than they appear here. 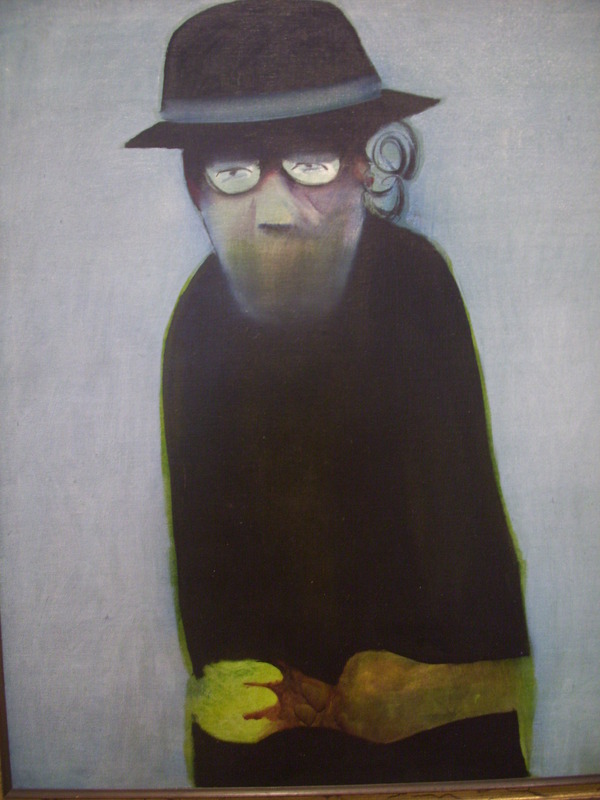 This painting caught my eye both because it’s striking and because it’s titled “The Inmate.” I did a bit of digging around online to try to find out where the title of this piece comes from, and though I didn’t get an answer to that question, I did discover that Charles Blackman was a terribly interesting and influential painter–one of the Antipodeans who were a Melbourne group of painters who protested abstract art. This painting might have nothing whatsoever to do with prison, but to me it feels like an apt representation of incarceration. The sad or possibly determined disposition of the woman and the blurred space where her mouth ought to be gives a sense of strife but a will to survive in spite of it. I saw far more in the gallery than I could share here with you now and loved every minute of my time there. I’m now very interested in reading up on Australian artists and their lives, so if anyone has any good books on that subject to recommend, please send me titles of things I should read! My loftier cultural pursuits on this trip have included reading Australian novelist Jessica Anderson‘s lovely Tirra Lirra by the River from 1978, which my very thoughtful husband gave me as a traveling gift. It’s an excellent book to read while on a journey because the narrative follows the mental wanderings of protagonist Nora Porteous, who travels a fair amount herself. I’ve been quite engrossed in it for the last few days in the meager moments I’ve had for reading, and I shall miss it when I’ve finished it tonight. 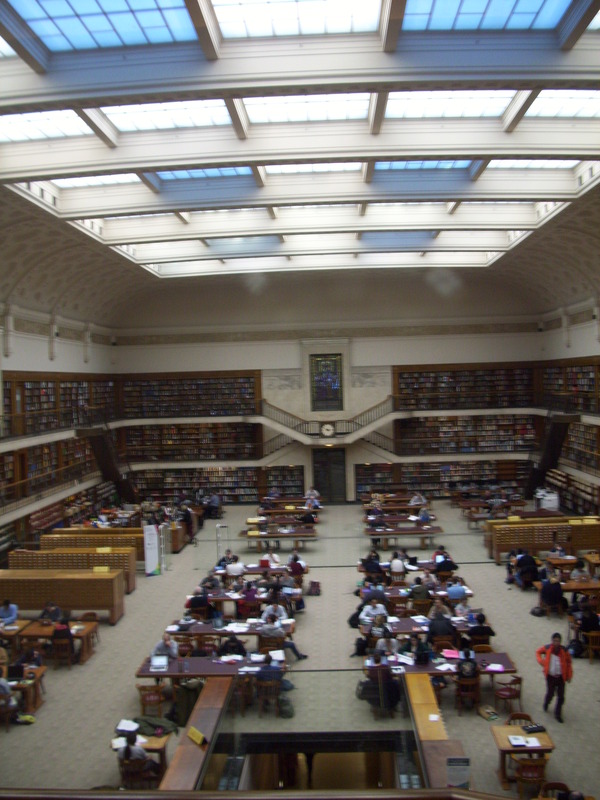 The main reading room at the State Library of New South Wales. Couldn’t you just die with joy? Those are books in three tiers of balconies running around the central atrium. It’s much more beautiful in person. If I lived in Sydney, I would spend inordinate amounts of time at the breathtaking State Library of New South Wales which houses over five million items in its astounding collection. I stumbled upon the building quite by accident in my wanderings around town and thought I’d died and gone to a book lover’s paradise. The library was founded in 1826, and like many of the large buildings in this part of Sydney, it has a grandeur that you must see in person to feel the full effects of its magnificence. I spent so long wandering the library’s exhibitions and halls that I ended up not seeing as much of the gorgeous Royal Botanic Gardens next door to the library as I’d meant to see that day. It was getting dark by the time I emerged from the library–a sensation all academics know so well that it’s oddly familiar even in a foreign land where folks drive on the wrong side of the road and eat inexplicable things like vegemite. 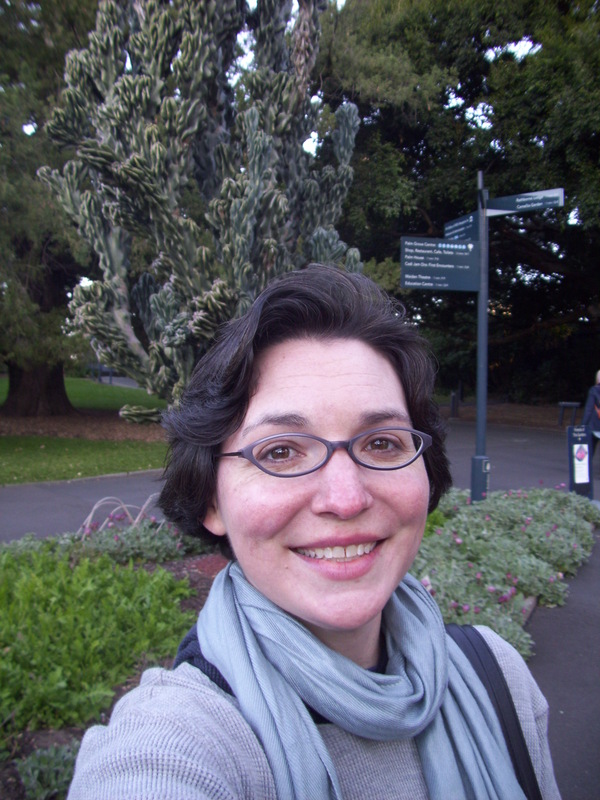 Here I am in the Royal Botanic Gardens with a very impressive cactus behind me. But the gardens! Oh the gardens! So lovely and so diverse. I saw plants that looked like things I’d previously only seen in Hawai’i and Cuba, and there’s an extraordinary fern collection and a huge garden of succulents. As a desert creature myself, I am always drawn to cacti and other desert plants, and I was particularly impressed with this large apple cactus which towered over me. On my first afternoon in Sydney I spent a good four hours at the Art Gallery of New South Wales. Like the glorious library and botanical gardens, it’s free to the public. There’s something really beautiful about throwing wide the doors to the best parts of your nation’s culture and not making people pay to see it. I have so much to tell about the gallery itself and the marvelous art within it that it shall have to wait for another post because my mother has been complaining that I’m not getting things onto the blog fast enough. So sorry! I’ll try to do better. Who Can It Be Now? It’s a Wombat! Wombat at the Taronga Zoo in Sydney. 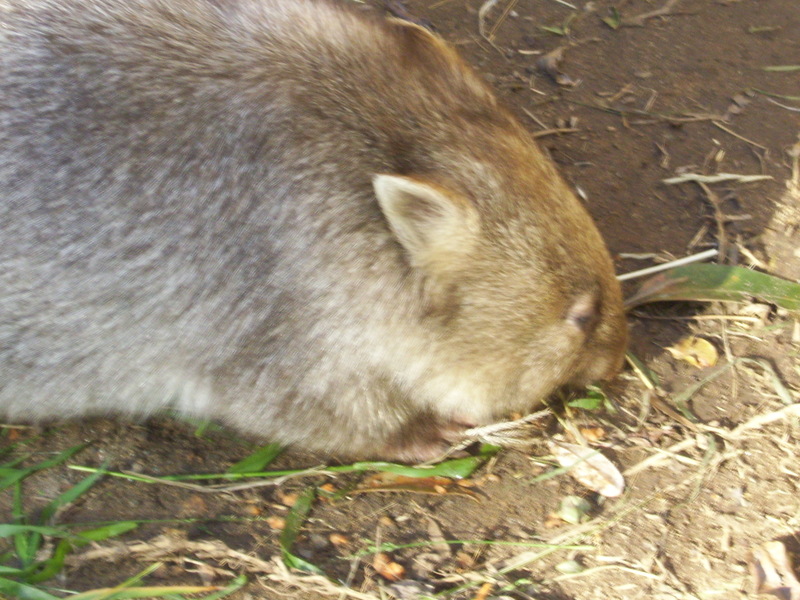 I’d intended to report chronologically on my Australian adventures and will endeavor to provide a fairly linear account of what I’m doing here, but I couldn’t resist jumping ahead a few days in my storytelling to report that I have seen the cutest of Australia’s natural wonders—get ready for it—THE WOMBAT! I actually encountered a couple of different varieties at the fabulous Taronga Zoo in Sydney, and my favorite marsupial did not fail to please. More on wombats throughout these chronicles from down under will surely be forthcoming, but I just couldn’t wait for you to see how precious a wombat really is. So chubby! Such a fine nose! This specimen was enjoying a carrot during my visit to the zoo. One further digression before I get back to my tale, you must check out the Periphery—a really great online literary publication which has previously published great work by Chris Dankovich who has also had quite a few pieces in PCAP’s Michigan Reivew of Prisoner Creative Writing. In addition to reading Dankovich’s story (and basically anything you find anywhere that Dankovich has written because he’s that good), you should take a gander at this piece that my very talented husband Phil Christman wrote about novelist and journalist Renata Adler, who, as Phil so eloquently argues, is well worth reading herself. Back to the other side of the world! Picking up my journey where my last blog post left off, I arrived in Sydney a little after 6 AM on what was July 2 here but still July 1 in my native land. The sun didn’t rise for another hour or so, and when it did, it was startling because my body felt like it was night but all of a sudden was being asked to begin a new day. Here I am in Sydney! It’s winter in Australia, which seems to trouble the locals greatly. They shiver and exclaim how cold it is and apologize to me as though they had done me some great offense in conjuring up clear skies and heavenly light with a bit of chill in the air. The weather has been mostly in the 50s during the day in Sydney, and the sun shines more brightly here now than it does in the height of summer in Michigan. I’m told that the ozone layer above Australia has suffered a good deal of damage, which is a great shame, but having survived a particularly cold couple of winters for the last two years in Michigan, I appreciate a good, strong ray of sunlight, even as I try not to dwell on our earth-wrecking habits as a species. When I tell folks in Sydney that in a few weeks I’ll make my way down to Hobart—a city on the island of Tasmania which is Australia’s southernmost state—my Australian friends wince and tell me that it’s been colder there than it ever has in the last sixty years. The internet (or interweb as I’ve heard Aussies say) has been showing lows in the 30s in Hobart—winter temperatures which would cause my University of Michigan students to run around in shorts and throw outdoor parties. My personal feelings about the cold have always tended to land squarely alongside those of my new friends down under, but I’m realizing for the first time since I’ve moved to the Midwest that I actually am more able to withstand the cold than someone else on earth! I dread the Michigan winters and complain just as bitterly as the Australians are doing now, but in this beautiful land of wombats and perpetual sunshine I stand out as a tough and wizened survivor of real winters. No one at home would ever believe that there was another person on earth who has a lower tolerance for the cold than I do, but there it is. Australia is a land of wonders. 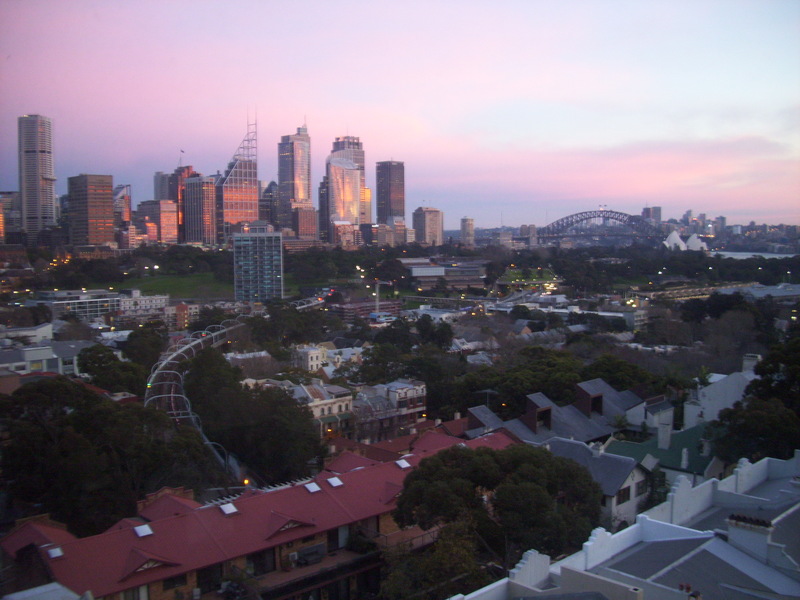 My residence in Sydney has been a very comfortable Holiday Inn in the charming neighborhood of Potts Point. Here and in several other residential neighborhoods through which I’ve wandered, the homes, apartments, and backpackers’ hostels have lovely little balconies with intricate wrought iron railings, reminiscent of those you might find in New Orleans but in a distinct style of their own. Sydney has a delightful architectural mix of very modern buildings and large, old stone edifices like those you might find in London. The colonial hand is evident throughout the city, which startled me more than it should have. Australia seems like such a far outpost of the British empire that I didn’t expect to find the Queen on postage stamps and currency, but there she is—blue hat and all. I’m still struggling to wrap my mind around Australia’s current political link to the United Kingdom. As I understand it, the Australian prime minister doesn’t exactly report to her Majesty, but the Queen does appoint a regent of some sort—called the Governor-General—whom she usually selects based on the Australian prime minister’s recommendation. However, this has more substance than the mere form of a shadowy monarchical figurehead. In 1975 the Governor-General exercised a never before used right to fire the Australian prime minister, install a temporary leader, and hold new elections for a permanent replacement. In an even more bizarre twist, in the subsequent vote the Australians overwhelmingly elected the gentleman whom the British had installed as their temporary leader. The prime minister who was thrown out must have been hugely unpopular, but it still seems like Australians might have been righteously upset about that heavy handed of a British intervention in their independent governance. I read only a few sentences of the history of this remarkable political upheaval and cannot pretend to have even the faintest grasp of what was really going on there, but it startles me to think that in such recent history the Aussies were not more fiercely protective of their independence. In 1986 the Australia Acts finally removed the British’s right to intervene in Australian government. It’s a strange and complex history. Then there’s the most bizarre tale I’ve heard of Australia’s history. In 1967, Harold Holt, the sitting Prime Minister, disappeared into the ocean at a place called Cheviot Beach and was never seen again. No body was ever recovered. How is it that the head of state of such a large nation in such a recent period of world history could have vanished into the sea? Furthermore, why hadn’t I ever heard about this until I read Bill Bryson’s delightful travelogue In a Sunburned Country? I digress. 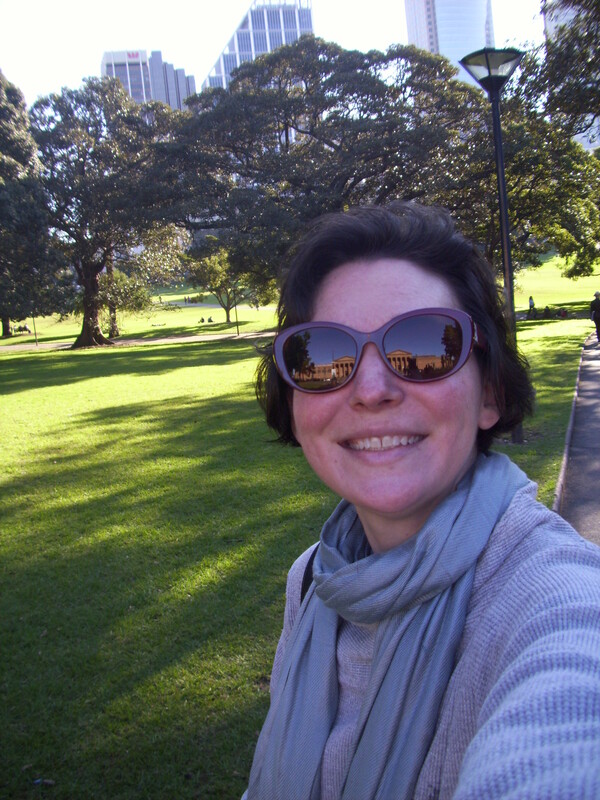 I’ve promised to tell you of my adventures in Sydney, and so I shall. My musings on Australian weather, culture, and history grow out of my fascination with the people and place I am encountering here. The wonders, great and small, rush upon me, and my thoughts and words go wandering. After checking into my hotel in Potts Point with a quite stunning view of the harbor, the Sydney Harbor Bridge, and the glorious Opera House, I set about exploring and went in search of food and some much needed coffee. I wandered in the direction of the large clustering of beautiful public parks and gardens in the heart of Sydney, conveniently located within walking distance of my hotel. I found a restaurant called the Pavilion on the edge of a huge expanse of green called the Dominion (a lot less intimidating than it sounds in U.S. parlance). 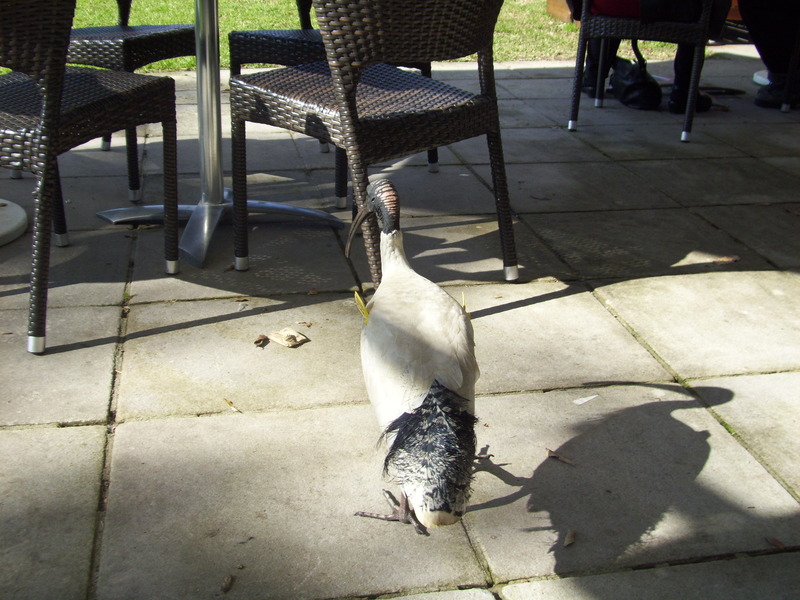 As I sat in the sunshine and ate a tasty meal, I had my first encounter with Australian wildlife. Some really cute brown birds sat on the backs of the other empty chairs at my table and talked to me while I ate. They were quite polite and had a good deal to say. There’s quite a lot of birdsong in the public parks of Sydney, and it’s unlike listening to birds in the U.S. Many different birds were talking in the park that day, and their songs were strange and melodious. When the little brown, chubby birds who were sitting with me started to talk, they puffed up big and fluffy and returned to their regular sleek appearance when they quieted down. After they’d said what they came to say, they fluttered off to talk to someone else. the chair next to me where they skillfully opened the packet and devoured the sugar. I was too fascinated to shoo them away, but they quickly left once they’d finished their snack. They had obviously done this before. Just as the parrots were departing, a white ibisy-looking thing about a foot and a half tall, walked past my ankles. I tried to take a picture but wasn’t fast enough. 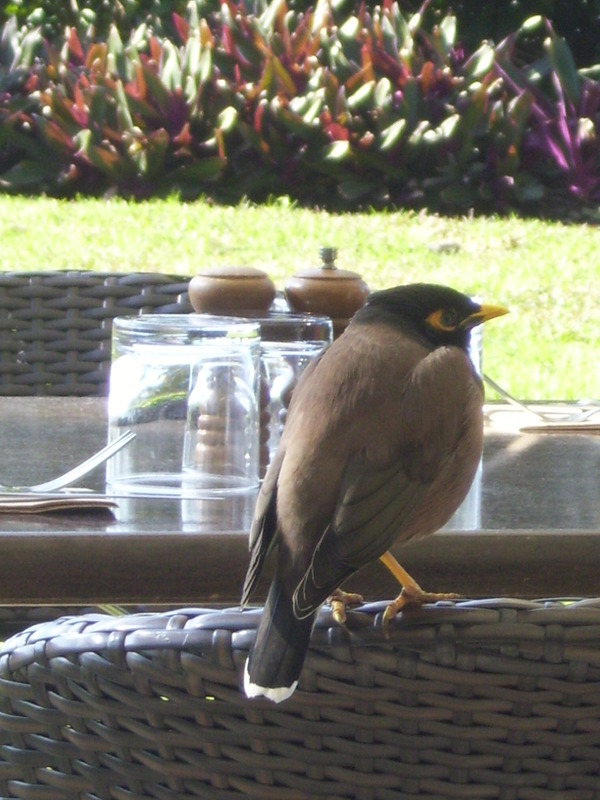 I stood up to turn to follow it for a better shot, and as soon as I stood, a fleet of the chubby brown birds landed on my table, ready to finish my half-eaten breakfast. 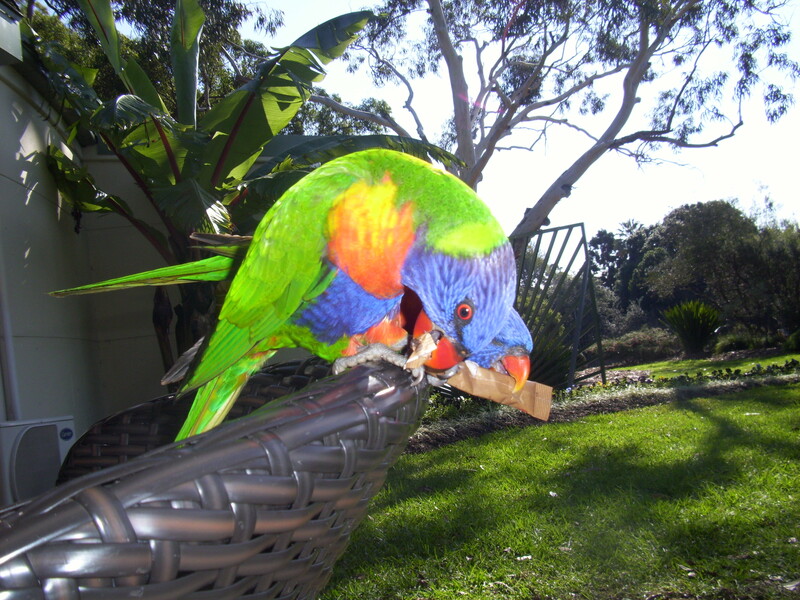 I let the ibis go and resumed my seat to guard my breakfast. The chubby birds departed but looked at me like I’d done them wrong. In my next post, I’ll tell you all about the fabulous New South Wales Art Gallery and its treasures. For the last two and a half years, I’ve been trekking around the globe whenever my teaching schedule permits in order to learn as much as I can about theatre programming in prisons around the world. I’ve just begun my last big international research trip for the book I’m writing and will be spending a little over three weeks exploring Australia and New Zealand. All my life, I’ve wanted to see Australia. In literature and film, I’ve been enchanted by tales of the vastness of its deserts, the strangeness of its wildlife, the decadence of its drag queens. It’s history of incarceration is as interesting and unique as its natural wonders. Australia is the only nation founded as a penal colony. Before the buildings we call prisons were ever erected on this continent, the British sent ships of captives and sailors to a land so distant and difficult to settle that landing upon its shores was a form of imprisonment. Those first settlers had no hope of a return passage to England, and the only lives they had known prior to their exile were gone from them forever. The sailors who journeyed with the imprisoned fell to the same lot as their wards and were equally punished alongside the men they were set to guard. Many of those sentenced to life in Australia were guilty of very minor offences—Bill Bryson remarks about one man who was sent across the globe for the offence of impersonating an Egyptian—and the effect of this was a deportation of a sizable chunk of England’s poor. This narrative of incarceration as a strategy for class and race containment recurs again and again all over the world. Though no one comes close to the horrific rates of incarceration in my home country, New Zealand has one of the next highest per capita incarceration rates in the world, precisely because they’ve ravaged their indigenous population. The Maori make up only 15% of the population of this island nation yet form 51% of their prison population. Michelle Alexander wasn’t just describing the U.S. when she wrote about prisons as the new Jim Crow. In fact, there’s not much that’s new about racism, class consciousness, and fear driving systems of punishment. I’m newly struck by this sadness in each country whose prisons I visit. That said, I am equally struck by the generosity and kindness that prison theatre makers and volunteers have shown me in every place that I have traveled to do this research. I’ve only just arrived in Australia, and the folks in Sydney have been extraordinarily kind. It seems to me that volunteering in prisons, particularly in ways that engage one’s creativity, makes people more considerate of one another in every place we encounter one another in the world. When you intimately understand the ways in which human beings have calculatedly stripped one another of dignity and freedom, it makes one want to treat those around one with as much respect and thoughtfulness as we imperfect beings can muster. I am immensely grateful to all the folks I’ve encountered in my years of travel who have made time for a perfect stranger who asks all sorts of probing questions about the sensitive work that they do under immensely difficult circumstances. Many more ruminations about prisons are doubtless forthcoming as I chronicle this trip, but for now I’d rather talk about the bizarre experience of getting to the other side of the world. It’s 8:30 in the morning as I write this from a charming Sydney café where I’ve had a fabulous breakfast. Many restaurants in Sydney serve breakfast until early afternoon, and I could definitely get used to this. Meanwhile, it’s yesterday where I live in Michigan—around 6:30 PM—which puts me a day ahead of my loved ones who are presently living the past while I wander about making new friends tomorrow, which feels very much like right now. Dr. Who would call this one of those timey wimey thingies, and there are certainly aspects of being in Australia that feel rather like science fiction. For starters, one flies in perpetual darkness from Los Angeles to Sydney and arrives two days after you’ve started. I realize that this has something to do with crossing the international dateline, but I understand that in the same way that I comprehend quantum physics or my relationship with Time Warner Cable. I had a window seat on the flight to Sydney, and though the middle seat was mercifully empty, I had a rather chatty companion in the aisle seat of my little row. Mary is a fifty-something Lebanese Australian housekeeper with four children, one of whom had just been married in Michigan. She was returning home to Sydney after about five weeks of travel in the U.S., including a lengthy stay at her brother’s home in Detroit. You may rightly assume that I know all of this because Mary saw fit to tell it to me. I am the sort of person to whom strangers tell the stories of their lives, especially when we happen to be seated next to one another on any form of public transit. I have no idea what it is about me that causes the ready unburdening of others’ souls, but it happens so routinely that my mother used to greet me at the airport by asking me to point out which friends I’d made on my journey. This gift of mine is particularly acute when I am seated next to anyone over the age of fifty. Women wish to adopt me as an extra member of their families, and men want to talk me into going back to their hotel rooms upon arrival in whichever place the plane, bus, or train is landing. This was a particularly acute problem when I was in my teens and twenties and thankfully appears to have waned a bit in the last few years. That is not to say that folks on public transit talk to me any less, but I am propositioned less often by men. I’m sure this has something to do with arriving at the ancient state of being in my mid-thirties—an age which I’m loving but about which the sort of men who try to pick up younger women are less excited. I’ve also now had a decade to practice my look of disgusted impatience with men who begin this line of inquiry with me. An air of haughty self-possession can go a long way to chasing off unwanted flirtation. This, however, has absolutely no effect on men or women who just wish to tell you about themselves, and the fact that I find most people absolutely fascinating does little to dissuade those who wish to talk to me, even when I would rather have this chat at some other time when I am not exhausted to the point of near collapse. Mary from the flight to Sydney needed help with filling out her immigration and customs form. I was relieved to find that she had not recently been exposed to Ebola and that she was not carrying illicit drugs or over 40,000 Australian dollars on our flight. It’s amazing what intimate things you learn when filling out someone’s immigration forms. When she wasn’t telling me about her family, she laid across the empty seat between us with her head in my lap and dozed, only to wake up again and warn me about how cold it is in Sydney these days. Bless the hearts of people in Sydney! It’s in the 50s here, and they’re all shivering. Mary was lucky to have visited Michigan in June. A February trip might have killed her. In keeping with my mother’s admonitions about how dirty airplanes are, I liberally wiped all the surfaces I might touch over the course of our flight with a Clorox wipe and offered one to Mary, who thought I was the funniest person alive for doing this. She gleefully wiped all of the MERS, MRSA, and whatever other forms of vile death lurk on germy airplane surfaces off her arm rests and tray table with exclamations that I was just like her! I thought this was amusing because she was simultaneously thinking me ridiculous for this precaution and likening me to herself. Perhaps believing oneself to be ridiculous is the key to happiness because Mary thoroughly enjoyed herself throughout our trip. She kept asking me to raise the shade on our window so that we could see what it looked like outside, and each time the darkness of the night was astounding. We didn’t even see stars or clouds, it was just sheer blackness. I found myself pondering why there are no stars on this side of the earth, for surely there must be. There was only one episode of Dr. Who that I can recall when something terrible made the stars disappear, and rather than contemplate this further, I closed my window shade and offered Mary a stick of Juicy Fruit. She was so delighted that I would share my gum that she offered to take me home with her for coffee and breakfast upon our arrival in Sydney. Though I would have genuinely loved to have seen her home and appreciated her hospitality, I had to decline because I knew that my husband was somewhere across the earth anxiously calculating the hours until my arrival and that if I didn’t get to my hotel and email him as quickly as I could, he would presume that one of those dreadful Dr. Who things had indeed befallen me somewhere over a vast expanse of ocean. We landed in Sydney in the unrelenting darkness with the watery lights of the city beneath us. Then my adventures really started.